Neill Blomkamp made a big splash with 2009’s District 9, his directorial debut which quickly became a sleeper-hit. The film had an original story, great visual effects that was rooted in gritty realism, and complex themes that surprised a lot of people for its depth. To this day it still remains one of my favorite sci-fi movies. With that in mind, there was a lot of pressure on Blomkamp’s next feature. The film takes place in the year 2154 on a densely-overpopulated Earth. With the planet on the brink of societal and environmental collapse, the wealthy elite leave the planet’s surface to take residence on the eponymous Elysium, a utopian space station orbiting high above the atmosphere. 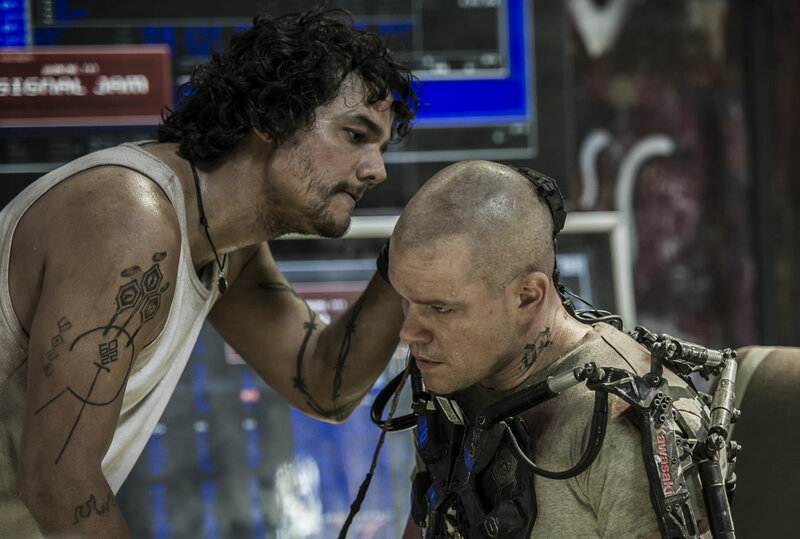 The story focuses on Max (Matt Damon), an ex-convict who dreams of one day going to Elysium. He soon finds himself involved in something much bigger that could change the fate of everyone on Earth. I strongly believe that with any sci-fi movie, worldbuilding is an absolute must if you want to create an engaging and totally believable environment in which to tell your story. You don’t have to put a big wall of text in the beginning or have extensive expository dialogue, but you need just enough to establish the state of the world and the people that live in that world. One of Blomkamp’s strengths is creating large believable worlds within his films. The opening sequence to District 9 quickly established how the “prawns” came to live on Earth and the wave of anti-alien sentiment that quickly followed. In Elysium, he does quite well at establishing a dystopian Earth. We see just how crowded the cities are and how pretty much everyone is part of the same lower class. Meanwhile, Elysium is pristine and devoid of disease and famine. The vast contrasts between the two places underlies the bigger conflict of class warfare that pervades throughout the film. Matt Damon’s performance is great in that he manages to create a likable character from the get go. From the opening moments where you see him being abused by the cyber-police, you immediately want to root for the guy. He has the right amount of charisma as a character who spends each time trying to make the most of life. I guess in a way, it speaks to a lot of people who just try to deal with the circumstances that they are born into and do their best each day. Aside from the fact that he has a criminal history, he’s just an average guy who eventually softens up and ends up bearing a lot of responsibility. 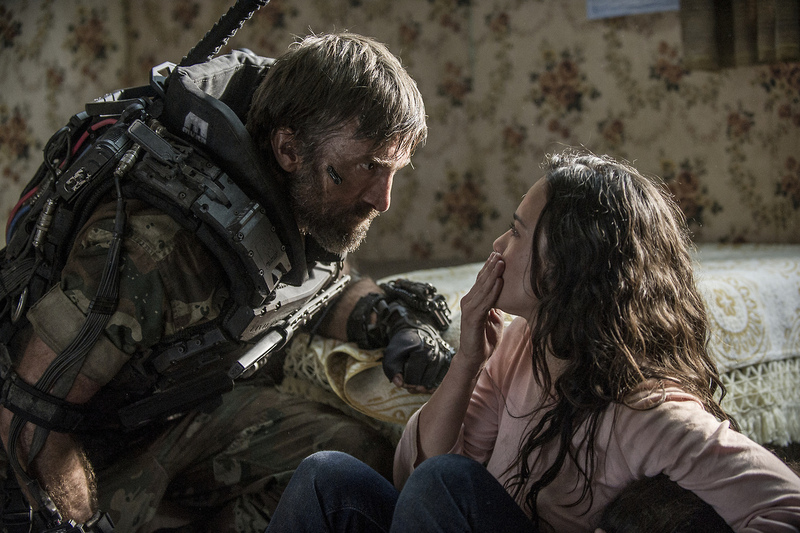 I also have to give special mention to Sharlto Copley’s performance as the ruthless (and slightly crazed) Kruger, the mercenary who ends up going after Max. It’s thanks to District 9 that Copley got worldwide recognition, landing him roles in big Hollywood films like The A-Team and the upcoming Maleficent. This time around, he gets to play an antagonist who, while ruthless, is quite a bit over-the-top. His character reminds me of the typical 80s bad guy who just seethes with evil in each scene. It doesn’t help that his South African accent keeps reminding me of his character in District 9. Even so, he absolutely owns his character and somehow manages to make it work within the film. Unfortunately, the same can’t be said with Jodie Foster, who plays the Secretary of Defense on Elysium. Somehow, her performance is even more over the top than Copley’s, yet lacking in character depth. Her plot to stage a coup and become president of Elysium is what sets everything in motion, yet we don’t get a lot of character development aside from her aspirations of power. She’s an extremely one-sided character who spends each scene snarling and conniving behind everyone’s backs. We’re supposed to get this idea that she’s an elegant and intelligent woman with a ruthless streak and a superiority complex, especially to the people of Earth. However, I had a hard time establishing that image in my head because we never really learn what her motivations are or why she’s so ruthless, other than the fact that she wants to be in charge. On that note, there’s a lot going on in this film that we really don’t get to spend much time with. There are multiple narrative threads throughout that begin to unravel as characters cross paths and stakes are raised. With so much going on at once, it’s a shame that the film’s central theme about class warfare gets lost underneath all the cool action scenes. It’s a shame, because it’s the kind of theme that I would expect Blomkamp to be able to masterfully weave into an allegorical narrative in a way that fits with his vision of a futuristic world as well as the present-day world. Instead, he sort of dances around the issue by not exploring it deep enough. We get it: capitalism and social status is bad for humanity in general. But like a one-dimensional character, I felt like the world of Elysium could’ve used more development in order to give those themes more impact. We never find out what lead the world to become this way, or how a select few were able to establish their own government and society out in space. There’s also the fact that most of the people we see are either white or hispanic; nearly all the people shown on Elysium were white as well. If you’re gonna try and show a world that is on the brink of ruin, it’d be nice to see more of that world outside of Los Angeles. I still enjoyed Elysium a lot. I’m all for original sci-fi movies that aren’t based on any preexisting materials or franchises. It’s got a great blend of sci-fi, social commentary, and action all wrapped up in a gritty “real-world” package. It’s the kind of stuff that Neill Blomkamp excels in. However, he absolutely missed an opportunity to tell a deep and complex story if he had decided to delve further into the issues he brings up. It waters down the overall message of the film, especially with an ending that’s almost too neat. 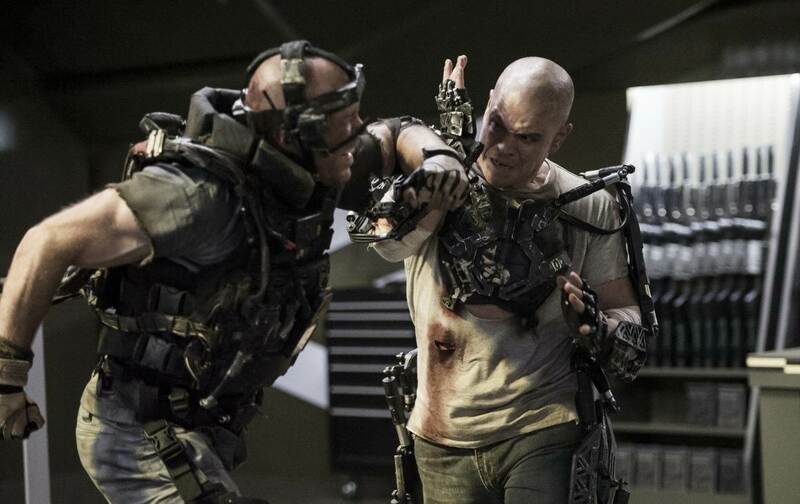 At the very least, Elysium is a great action flick that, ironically, is a lot more entertaining to watch than it is to watch it try and deliver some deeper message. Despite featuring plenty of promise that it sadly doesn’t live up to, it’s still fun and thrilling enough to be watched and enjoyed. Good review Mahou.